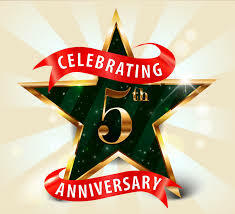 Celebrating My 5 Years with Stampin’ Up! 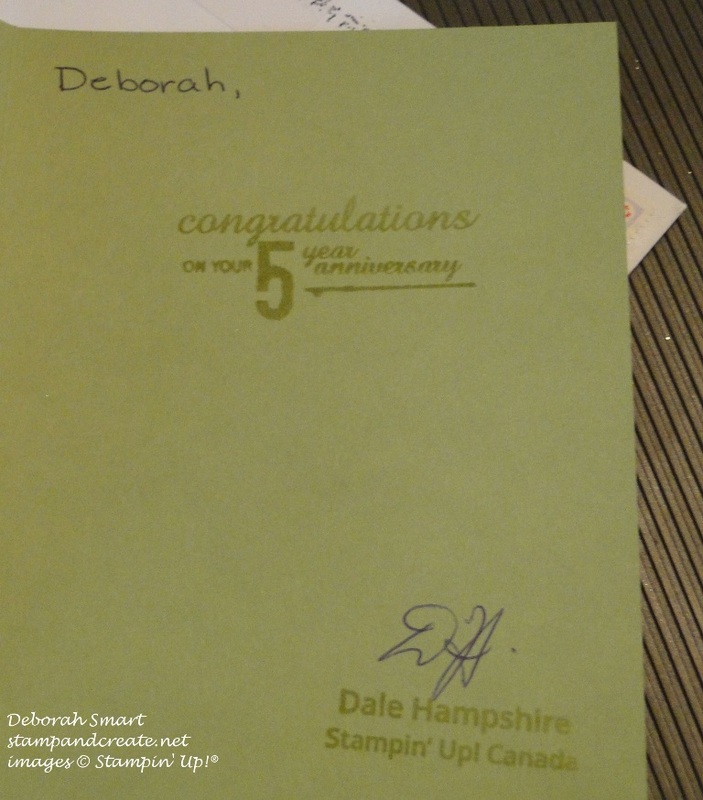 That’s right – it’s been 5 years since I joined Stampin’ Up! I still remember making the decision; I thought about the great deal I was getting on the Starter Kit, and I thought I’d ‘give it a try’ to see if I wanted to sell the products. The anticipation of waiting for my Kit, and the excitement in opening up the boxes – even my 2 boys were helping me unpack them! Well – you can see how that worked out! 🙂 I’m still here, and not only sharing the terrific products and all the ways to use them, but I’m building my own team of demonstrators, holding classes, presenting at home parties, and having booths at craft fairs. And yes- I’m really enjoying myself! I have to say that the best part of being a demonstrator is the people that I meet. I get to meet people who are from different parts of the world – both customers and other demonstrators; who have all different kinds of jobs and life experiences, and we have at least one thing in common to start – our love of stamping! Being part of the large world-wide Stampin’ Up! family has enriched my life in the demonstrator friends that I’ve made, the stamping and business experience I’ve gained, and the fun and informative Stampin’ Up! events that I’ve attended. It’s signed by Dale Hampshire, who is our Canadian Stampin’ Up! Manager. I know that a lot of demonstrators who are part of the Canadian Focus Team spend their time creating these cards, so I just want to say ‘thank you’ to them for their time, and for Dale & team for sending out these cards to us Canadian demonstrators. Anyway, I wanted to let you know about this milestone, so that I can share the celebration with YOU, stamping friend! Because of course, I wouldn’t still be here, 5 years later, without your support, encouragement and sales. For ALL orders of $50 or more dated between October 20th – October 31st, I will send you a Coupon for $5, to be used on your next order of $50 or more! Coupons can be redeemed on products from the Annual and Holiday Catalogues, and any other current catalogue at the time of ordering. They can also be redeemed on products from the Clearance Rack. To place your order and receive your Coupon, click on the button below! For online orders, you must use the HOSTESS CODE WXT9MADK to receive the Coupon. Or, you can contact me directly to place your order – I’m always happy to do this for you! Just call me at 604.298.0472 or email me at debsmart@shaw.ca Due to demonstrator rules, I can only fill orders that are delivered within Canada. Thank you for helping me celebrate my 5 Year Anniversary! I’m looking forward to celebrating many, many more! Next Next post: Exciting New Release! 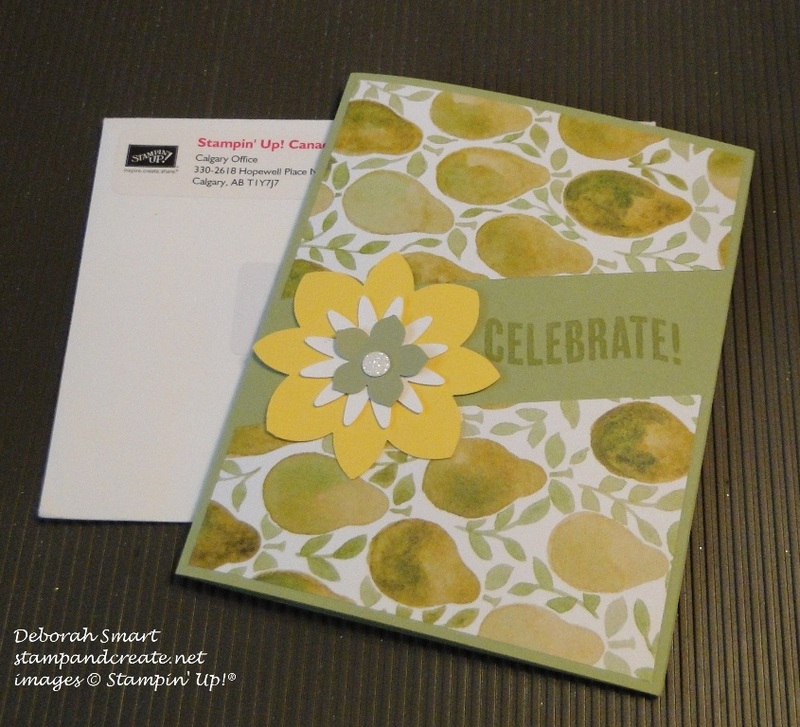 Congratulations on your 5th Anniversary with Stampin’ Up. I just wanted to say Congrats, my 5th year was in March of this year. Isn’t it a pleasure to be doing something that we love to do so much? Have a blessed year! Happy Anniversary, Deborah!!!! I’m so glad you joined the SU family. You’ve inspired me more than you’ll ever know. You rock, Girlfriend!! !